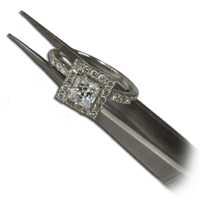 At Oceanside Jewelers we offer a full range of jewelry services including jewelry appraisals. We offer appraisals for insurance purposes, as well as trusts and estates. Most insurers require items above $1500 to be individually listed and scheduled on the insurance policies or insurance riders. Most insurance companies require current jewelry appraisals that are usually no more than 3 to 5 years old. At Oceanside Jewelers all of our appraisals are done by a master jeweler and a GIA graduate Gemologist. In today’s market place it is not uncommon for jewelry stores to sell items with over inflated jewelry appraisals in order to make the item look like a great deal or to make the consumer think they are getting more for their money than they did. Here at Oceanside Jewelers we make sure you get a fair jewelry appraisal which represents a true and accurate replacement value. With most insurance companies paying the jeweler directly and even dictating their profit margin these over inflated jewelry values only end up costing the consumer more money in unnecessary insurance premiums. At Oceanside Jewelers the replacement value on our jewelry appraisals for insurance reflect a true fair market replacement value. When you come in to Oceanside Jewelers with your gold jewelry, diamond jewelry, gemstone jewelry or fine watches for a jewelry appraisal we first clean the jewelry then thoroughly inspect it measuring all the gemstones and grading all diamonds for color, cut, clarity and estimated weight. We then photograph the item. We research what comparable diamonds and precious stones are selling for, the labor that goes into the manufacturing of the piece and what it would cost to make a comparable piece. With all this information we are able to provide you with a fair and accurate jewelry appraisal. Jewelry appraisal prices vary depending on the complexity of the piece being appraised. When you are having multiple pieces of jewelry appraised we will offer you a group appraisal discount. If you have any questions regarding your appraisals please feel free to call or stop by!